Why not take the time to tune up and improve each other’s bikes together? If you’re not comfortable tinkering with something that is already working, another option is to go visit a local junk yard and see if you can find a motorcycle worth salvaging. Depending on what needs to be done , and your skill in acquiring the necessary parts this activity might be a little bit expensive, but it can be a great way to learn a bit more about motorcycle maintenance. idea is that it is something can be done over time, allowing you to build a solid relationship both with your motorcycle and biker friends. It allows you to see them in a new light and often in a messy one, since grease, oil stains and grime are common things found around a motorcycle mechanics area. So if you’re not afraid to get your hands a little dirty, you might just be able to see your fellow motorcycle lovers in a brand new light. 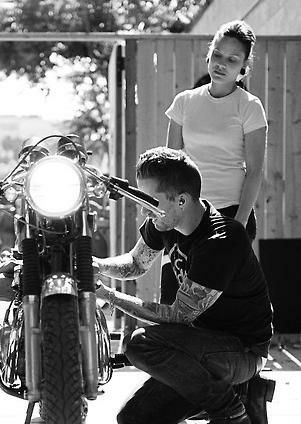 Working on your motorcycles together can help a relationship in a number of different ways. First, working together on a project such as this can be a great way to learn if you and your biker girl can work together, something which is important in any relationship. Also, it helps you to learn more about your motorcycles, and therefore how to better ride them. After all, the more you know about the machines, the more you can potentially know about the capabilities of your motorcycle and how to use them effectively. It’s also a good way to learn something new, and to learn where your comfort levels are. Remember that there is absolutely no shame in bringing in outside help when needed. The last thing you need is to have your motorcycle project become a safety hazard.